Product prices and availability are accurate as of 2019-04-25 00:35:39 EDT and are subject to change. Any price and availability information displayed on http://www.amazon.com/ at the time of purchase will apply to the purchase of this product. This kit is designed for use in the USDM 2008-2017 Subaru WRX STi (EJ257 only) and replaces the OEM fuel pressure regulator and damper assembly, shown below. 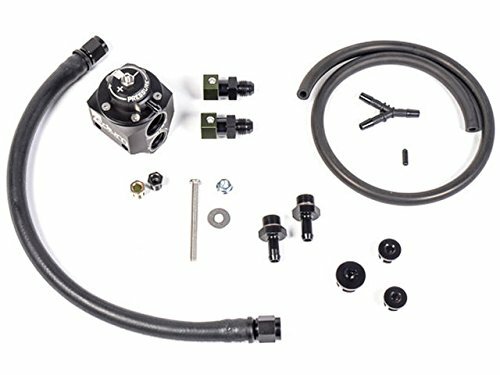 The factory STi fuel line routing uses a quasi dead-end system that circulates fuel through the regulator, bypassing the engine. Fuel is only routed to the engine when there is demand. The kit installs in the same location as the OEM fuel pressure regulator. Also included are vacuum hose and fittings to re-route the vacuum reference line from the #4 cylinder runner to the intake manifold plenum for a stable vacuum signal. The Radium FPR kit replaces the factory regulator and re-routes fuel to cycle through the engine's rails before reaching the regulator, and returning to the tank. This is the preferred fuel line routing by Subaru tuners trying to address stumbling issues. This kit is designed for use in the USDM 2008-2017 Subaru WRX STi (EJ257 only) The kit installs in the same location as the OEM fuel pressure regulator. This is the preferred fuel line routing by Subaru tuners trying to address stumbling issues.